The 900 Omega Mixer Mincer is the most compact in the range of Thompson Mixer Mincers. The Omega occupies 950mm x 640mm floor area (excluding the barrel and accessories). Whilst the body size has been reduced the machine still maintains the same bowl size and powerful drive motors which are synonymous with the 900 Mixer Mincer. 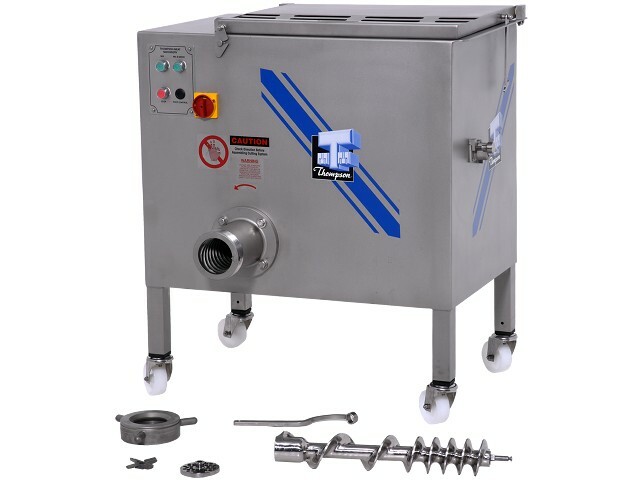 With a mincing head size of 32 series (90mm dia) the Thompson 900 Omega is designed to mince fresh meat expediently, achieving outputs only expected from much larger machines. The Thompson 900 Omega will mince very efficiently giving a high definition and quality of cut. The product consistency and labour savings to be gained by all of these attributes will impress the most conscientious operators. The Thompson 900 Omega has been ergonomically and hygienically designed from high quality stainless steel. The barrel, feedscrew, lockring and mixing paddle are manufactured from the same high quality stainless steel. The mixing paddle is programmed with an automatic reciprocating duty cycle which delivers an efficient mix and dispensation of the product. It has the added benefits of having a quick release and being removable. The powerful 4 kW motor ensures the feedscrew discharges efficiently whilst minimising squashing or pulping of the product.